If we buy a DIY computer, we have to partition the hard drive and install Windows operating system before using it. Usually, we split the hard drive into several partitions, the partition for storing the operating system and its setting is system partition, often named Partition C:. 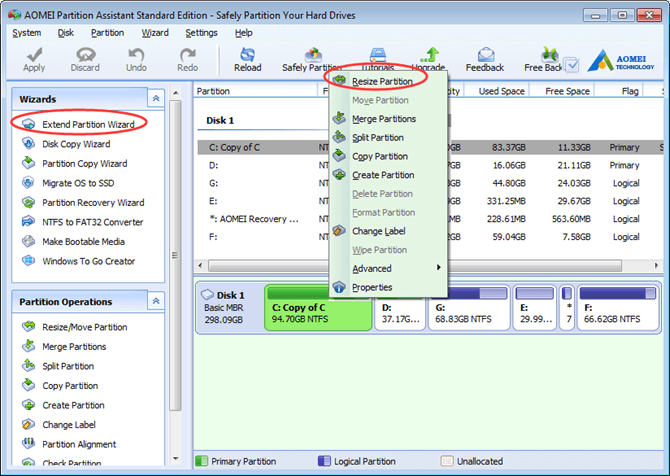 Other partitions are used for saving different kinds of data. Since we can’t predict what will happen in the future, so the first time of partitioning hard disk maybe unreasonable one day, some partitions are big, some are small, some full, some still empty. Thus, users need to re-partition or say, resize partition. Windows has built-in Disk Management tool, but it has many limitations. You can’t extend system partition if there is no unallocated space. Windows’ program can’t move partition, and you won’t delete data partition, so it is impossible to expand system partition with Windows Disk Management. To solve this problem, we need the help of third-party partition software. Professional Windows partition manager – AOMEI Partition Assistant is coming! To extend the system drive, you have many ways with the help of AOMEI Partition Assistant: Choose Extend Partition Wizard from the left Wizard panel or choose Resize Partition from the context menu. See from the main interface of AOMEI Partition Assistant; you can find AOMEI Partition Assistant is a full-scale partition tool. Move partition, merge partition, split partition, copy partition, create a partition, delete a partition, format partition, wipe partition, change the label, align partition, migrate OS to SSD, recover partition, convert NTFS to FAT, make bootable media, build Windows To Go on any Windows OSes and so on. AOMEI Partition Assistant has all Disk Management’s functions and has many advanced functions Disk Management has no. More operations are in the secondary menu or other right-click menu or pop-up window. For example: hide partition, rebuild MBR, initialize disk, set active partition, sector by sector copy, etc. Usually, for common people, AOMEI Partition Assistant Standard Edition is enough. Besides this, AOMEI Partition Assistant has other five editions: AOMEI Partition Assistant Lite(Free), AOMEI Partition Assistant Professional(Paid), AOMEI Partition Assistant Server(Paid), AOMEI Partition Assistant Unlimited(Paid) and AOMEI Partition Assistant Technician(Paid). It’s worth mentioning that some features in similar partition software are paid, while in AOMEI Partition Assistant is free, such as quick partition and command line partition. When using a computer, the volume of our partition will be smaller and smaller day by day, especially the system partition. We can clean junk files, but the space still tight, the only way is extending the partition. The all-in-one partition manager – AOMEI Partition Assistant, is an excellent choice. It gets many good reviews from popular software website, and it is an excellent product without a doubt.